It turns out Alan Wake's reputation for being a commercial flop is undeserved. Nearly a million digital copies were downloaded, none of which added to the NDP sales figures. Whoops. 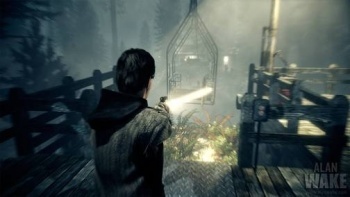 The current NPD sales figures for Remedy Entertainment's Alan Wake stand at 330k units, a paltry figure given its five-year-plus development cycle, the mountain of hype it received prior to release and its very positive critical reception. According to the scholars over at Industrygamers, however, that figure should be closer to 1.5 million. Last holiday season, Microsoft launched a bundle that included the new slim 360, a physical copy of Forza Motorsport 3 and a coupon for a digital copy of Alan Wake. It held a similar promotion this year, offering a digital copy of Halo Reach with the bundle. Strangely, while Halo Reach's digital downloads were added to its overall sales figures, Alan Wake's weren't. "Unfortunately we can't share numbers with you ... The Wake bundles are substantial, in fact about half of the story - the untold story if you like," said Remedy's head of franchise development, Oskari HÃ¤kkinen. "At the end of the day, we all love to follow charts, but the most important thing for Remedy really is about knowing how many people we reach and entertain - not necessarily what a measure or sales chart says." It's also worth noting that according to Torrent Freak, Alan Wake was the second most pirated 360 title in 2010, with an estimated 1.1 million downloads. Don't be tricked into thinking pirates have good taste though, the most pirated 360 game of 2010 was EA's ham-fisted God of War knock-off Dante's Inferno. Unfortunately, the damage seems to have already been done. Alan Wake's reputation as a flop killed the much anticipated PC port dead in its tracks, and there's still no confirmation of an Alan Wake 2 - worrying, considering the obvious sequel hook in the game's ending. A standalone digital follow-up, which is neither DLC nor a true sequel, is in the works for the 360. We'll have more information on that when it's revealed on December 10th at the Spike VGAs.